by Seton Motley: Florida Republican Senator Marco Rubio was once the next, newest Conservative Golden Boy…for about three seconds. In the midst of the 2010 Tea Party-fueled revolution election, Senate Republican Leader Mitch McConnell was desperately trying to fend off conservative insurgent candidates. Who were looking to represent the GOP base – who have the audacity to expect the DC GOP to actually do the less government things upon which they always campaign. Then-State House Speaker Rubio declared early for the Florida Senate seat. And after having been a state-level leading advocate for illegal alien amnesty – promised conservative and Tea Party leaders he had experienced an awakening. And that he was now on the side of the law-and-order angels on immigration policy. It was largely this promise – that secured him widespread conservative support. And the malevolent neglect of McConnell. Who let Rubio languish for months – and then immediately endorsed squishier-than-Squish alleged Republican Charlie Crist the second Crist announced. Rubio – who had initially been polling at a very meager five percent – won the primary over Crist, defeating the DC GOP Establishment. And then won the general. All thanks almost entirely to his conservative supporters – who backed him based largely on his immigration mea culpa promise. But just about the first thing Rubio did after unpacking his boxes in his regal new Senate office – was screw everyone on illegal alien amnesty. The conservative response was immediate – and perfectly, reasonably understandable. It looked so bad for Rubio that in March of 2016 – his re-election year…. But then in June 2016…. “Trump” is, of course, Donald Trump. The out-of-nowhere presidential candidate – who eventually won…based largely on his promise to stop illegal aliens from illegally entering the country. And Rubio was blasting Trump – for promising the exact same thing Rubio his own self had promised to get elected. Before screwing everyone on it, of course. Not so much with Rubio’s amnesty mea culpa, it would seem. Since winning the reelection he promised he wouldn’t seek – Rubio has continued to be inordinately unhelpful to those of us who want less government. Remember, it was conservatives who waded into the 2010 Florida election – against the DC GOP Establishment – to ensure Rubio won. We are now deeper into the 2018 election. And Florida Democrat Senator Bill Nelson is up for reelection – and very vulnerably so. Republicans have an excellent candidate – popular sitting governor Rick Scott – and an excellent opportunity to pick up a seat in a very swing (and trending poorly) state. And where is our sitting GOP Senator on all of this? All of which brings us to the Republicans’ tax cut and reform law that passed late last year. The Republicans’ tax cut and reform bill – for which Rubio voted. But you’d never know Rubio voted for it – if you looked solely at his post-vote cavalcade of comments. Let’s peruse some of the very helpful headlines, shall we? Well, all of that is very helpful. But Rubio wasn’t finished. Not satisfied with his inanity during Round One – he waded in again for Round Two. In fact, Rubio took said second shot…in writing. He tried to do damage control – by dressing up his shot in allegedly conservative garb and publishing in a conservative publication. But a second shot it was, nevertheless. Even more election year assistance from Republican Rubio – for Democrat Nelson. Of course, Rubio is on the tax reform law – nigh entirely incorrect. That’s a whole lot of benefits for a whole lot of workers. You know – the ones Rubio said didn’t overwhelmingly benefit. And before we move on from this – the ATR list is only a compilation of direct worker benefits. Anyone who understands very basic market economics knows the IN-direct benefits – will be even more fruitful and bountiful. Anything private sector companies do with their money – helps the economy. Which helps workers – because it helps everyone. I can’t find a link, but I remember Trump at one point saying he doesn’t just want everyone to have a job – he wants everyone to have multiple job offers. Which would mean a bidding war for each person’s services – which would mean much higher wages and much better benefits. This only happens – when private companies keep more of their coin. And with it do all sorts of things – beyond just increasing existing employees’ wages and benefits. Rubio decries things like stock buybacks. Which are really great for shareholders – including we tens of millions with retirement accounts. But these buybacks – are companies reinvesting in themselves. To grow – and thus hire more people. Thus getting us closer to Trump’s vision. Of each American getting to choose between multiple job offers. And thereby getting much better wages and benefits. Oh: And of course another of the objectives of tax reform – was to make America a much more attractive place to do business. Which it indubitably does. Which means businesses that aren’t doing business here – will start. And those that are – will expand. All of which means more job offers. Again getting us closer to Trump’s vision. Again sailing clearly over the head of Rubio. 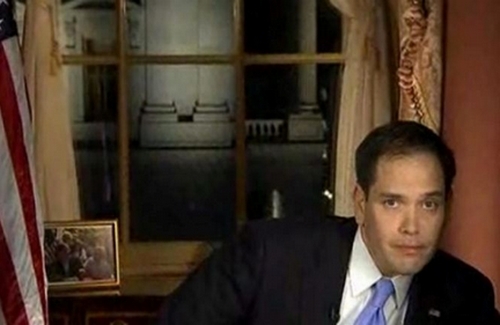 Rubio remains, as always, so very helpful. Tags: Seton Motley, Marco Rubio, Perhaps, Least Helpful, Republican To share or post to your site, click on "Post Link". Please mention / link to the ARRA News Service and "Like" Facebook Page - Thanks!